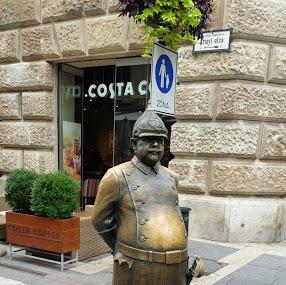 The Fat Man Statue is one of the attractions to adorn the streets of Budapest. Budapest is known for various structures that are slightly whimsical and unconventional completely, the fat man statue is definitely one of them. There is not much known about this statue except for the fact that rubbing his belly does have some significance- the unmentionable kinds. It is better that you hear the theories from the locals itself as there are various interesting versions. You can visit the statue any time of the day. How popular is The Fat Policeman Statue? People normally club together Little Princess Statue and Girl With Her Dog Statue while planning their visit to The Fat Policeman Statue. Full size replica statue of the 'Fat Policeman'. He has a very shiny belly as people rub it as a symbol of good luck. Put your hand on his belly and rub it. They say it gives luck to love.